Are you interested in teaching young children, but worried that you don't have the time to go back to school for your degree? If so, an an online bachelor's program in early childhood education might be the perfect fit for you. Students in an online ECE program can pursue their degree without disrupting their current professional obligations. For those concerned with cost, affordable online early childhood education degree programs are available. As with comparable campus programs, they prepare students to effectively teach and mentor young children in a variety of early development settings. As part of the degree, students can also prepare to pursue professional teaching licensure in their home state. Graduates of early childhood education online programs often go on to rewarding careers as preschool, kindergarten, and elementary school teachers and administrators. If cost is a driving factor in your decision, it's tempting to look for the cheapest online early childhood education degree available, but true affordability takes into account so much more. As you evaluate prospective schools, it's important that you distinguish between a cheap college and an affordable one. A cheap school offers low tuition and nothing more; an affordable online early childhood education program combines reasonable tuition with a good education, high graduation rates, low student loan default rates, and positive employment outcomes. 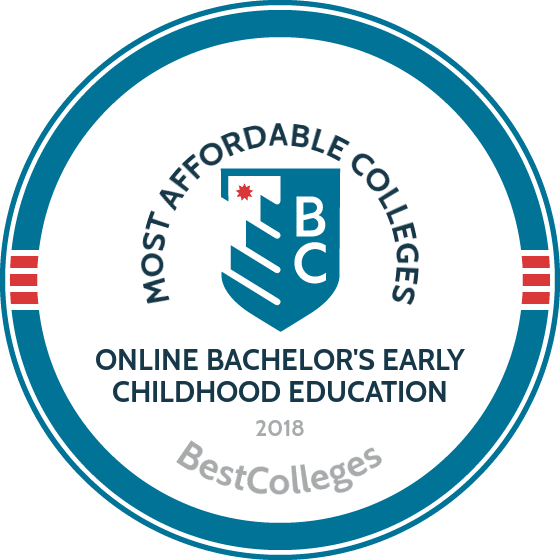 Below, you'll find our list of the 25 most affordable online bachelor's in early childhood education programs in the country. Factoring in a variety of metrics, our College Affordability Score has identified the best online programs in early childhood education. If you're thinking about returning to school for your degree, and are interested in taking classes online, be sure to take a look at these top programs. Florida International University's early childhood education degree online is a completely online program that focuses on the development of the whole child. Students take courses on the cognitive, social/emotional, and language growth of children. Learners must earn at least 120 credits to graduate. The affordable online ECE degree requires applicants to have a minimum 2.5 GPA in all lower division coursework, which must amount to a minimum of 60 credits. Learners may begin the program in the fall, spring, or summer term. Each undergraduate is assigned a "success coach" who helps them through their studies. Each state has different licensure processes and may require individuals to take different courses toward their teaching certifications. FIU's main campus is located in Miami, Florida. This program does not result in teacher certification. Freshman students must submit ACT or SAT scores. Brandman University, located in Irvine, California, offers a bachelor of arts in early childhood education degree online that gives students the training, skills, and resources to care for and educate children up to age eight. The program includes two practicums and a fieldwork experience. There's also a capstone course that allows students to showcase the skills they have learned throughout their undergraduate studies. This ECE degree online program, which includes 51 credits (in addition to at least 60 lower division credits), prepares students for entry-level employment or advanced studies. The school also offers an MA in education, leadership in early childhood education and an MA in special education-early childhood. Brandman, part of the Chapman University System, serves about 12,000 students each year through its more than 50 accredited undergraduate and graduate programs. Florida State College at Jacksonville's BS in early childhood education program prepares the next generation of pre-kindergarten through third-grade teachers and allows them to take courses completely online. The program requires students to earn at least 120 credits. Learners may begin their studies in the fall, spring, or summer terms. The early childhood education major consists of 36 credits. Prospective students must have completed an associate degree in early childhood management or a related field and have taken and passed three courses: introduction to education, introduction to diversity for teachers, and introduction to educational technology. Applications are due June 1 (for fall), October 1 (for spring), and February 1 (for summer). Students must create a professional portfolio and pass the GK, PED, and PK-3 Florida state teacher certification exams. FSCJ's affordable online early childhood education degree is fully accredited and approved by the Florida Department of Education. Fort Hays State's BS in early childhood unified prepares students to become successful teachers, coordinators, and school administrators. The program carries the "unified" moniker to reflect the fact that special education instruction is included in the required coursework. Students must earn 127 credits to be eligible for graduation, including 40 credits within the ECE degree online program and 12 from the required student teaching experience; the rest are in general education or professional studies coursework. FHSU is located in Hays, Kansas, and its online early childhood education degree meets the standards of the Kansas Department of Education. Graduates meet Kansas' state licensure requirements, although other states may have different standards. Through its Virtual College, FHSU offers more than 50 online degrees and serves about 6,000 students each year. Fresno Pacific, a nonprofit Christian university located in Fresno, California, offers a BA in early childhood development program. Students can complete their coursework completely online or through a blended format, in which they combine digital classes with traditional in-person courses. The early childhood education degree online program places students in cohorts of 12-24. Learners work together as they move through the program synchronously. The curriculum is compliant with the standards of the California Preschool Learning Foundations. The program includes a course in Biblical perspectives for educators, providing a Christian foundation for all coursework. The online early childhood education degree requires students to earn at least 39 core credits and 60 general education credits. All learners pay the same affordable tuition rate, regardless of residency. To be eligible for admission, prospective students must have achieved at least a 2.4 grade point average in all lower division courses. The University of Nebraska at Kearney’s early childhood inclusive bachelor's degree emphasizes flexible educational opportunities to current teachers and professionals. The program is designed for learners who have completed all or most of their general education requirements at a junior or community college. In addition to 46 general education credits, students must earn 24 professional sequence credits and 50 program-specific credits. The affordable online ECE degree has students select from two areas of specialization: birth through kindergarten and age three to grade three. Both include a field experience that gives students a real-world perspective of early childhood education and enables them to learn from experienced professionals. The UNK ECE degree online program provides students with the necessary knowledge to pass Nebraska state teaching license exams. Those seeking licensure in another state should check with their state department of education to learn about specific requirements. The WVUP child development program allows students to take all courses online, although they may need to attend class in-person to complete their general education requirements. This is not a factor for transfer students who have already finished their general education credits. This affordable online early childhood education degree is designed for learners who want to focus their careers on educating children from birth through age five. Graduates are prepared for careers as preschool teachers and head start coordinators. Students learn how to help children in their cognitive, social-emotional, and physical development from an early age. WVUP's distance learning courses meet the needs of parents and working professionals, who benefit from the flexibility of online coursework and the ability to complete assignments asynchronously. Face-to-face requirements include a practicum, a field experience, and a proctored test. Pacific Oaks' online early childhood education degree teaches students to foster positive educational environments for young children. The program has concentrations in STEAM, trauma, dual California teaching credential, and preliminary multiple subject California teaching credential. The program consists of 63 credits and takes about two years to complete when attending full time. Part-time students can typically complete the degree requirements in four years or fewer. For current professionals, Pacific Oaks' credit for learning from experience enables students to earn up to 24 credits for qualifying work experience. This affordable online ECE degree requires students to have an undergraduate grade point average of at least 2.0, along with at least 48 credits and/or an associate degree from a regionally accredited college. Applicants also must submit a personal statement and resume. Granite State University, located in Concord, New Hampshire, offers a comprehensive and affordable online early childhood education degree. Students gain the skills, training, and resources they need to successfully teach children from nursery school to the third grade. The program emphasizes working with young people who may need special education interventions. The ECE degree online program accepts applications on a rolling basis, and students may begin their studies any term. The program is flexible and works well for people who need to balance various personal and professional obligations. Individuals with a high school diploma or who have passed a high school equivalency exam may be eligible for admission. This affordable online ECE degree is accredited by the New England Association of Schools and Colleges and is available completely online, although a fieldwork experience is required. Students must earn 120 credits, including 54 within the early childhood education major. Southwestern College in Winfield, Kansas, offers a BA in early childhood education degree. The program, which can be completed entirely online, prepares students to teach children from birth to the age eight. The college has its own preschool, providing a unique opportunity for students to gain real-world teaching experience on campus. Graduates are prepared to seek teaching licensure through the state of Kansas. Students must remain in good academic standing throughout the program and earn at least 124 credits, including a minimum of 30 credits through the school. Courses taken through Southwestern must be completed with a minimum grade of C. Major courses include infant development, technology in special education, and teaching young children with disabilities. The online early childhood education degree requires students to have achieved a minimum GPA of 2.75 while completing at least six college credits at an accredited institution of higher learning. Wilmington University's BS in education studies program offers a concentration in early childhood education, giving students the skills, tools, and resources they need to effectively teach children from birth to age eight. Courses are available online and at the university's campus in New Castle, Delaware. Students in this early childhood education degree online take courses in health and nutrition, differentiated instruction, and the development of individual education plans. The program consists of 122 credits, including 39 within the major. WU's ECE degree online program requires students to take and pass two courses for admittance, which are EDU 102 (E-Folio) and EDU 203 (Instructional Technology). Coursework includes weekly assignments, readings, and other projects. Students collaborate with their instructors and peers by using the Blackbird digital learning program. WU's affordable online ECE degree is accredited through the National Council for Accreditation of Teacher Education. Concordia University-Portland delivers an early childhood education degree online program that focuses on preparing students who want to work with children from birth to age five. The non-licensure program includes 12 courses that students take over four semesters. The degree is a flexible option for working professionals who are already serving in a childcare or preschool setting. Students earning this affordable online ECE degree get placed in cohorts, allowing them to get to know their peers and work together on various projects and assignments. Students must complete a one-semester internship, working directly with an experienced early childhood educator in a real-world environment. Each student receives the assistance of a transfer coach, who helps ensure they complete all their lower-division course requirements in an efficient manner. Mount Vernon Nazarene University, located in central Ohio, offers a nationally recognized bachelor's degree in early childhood education that prepares students for careers working with young children from birth to the third grade. The online early childhood education degree boasts an experienced faculty made up of professionals who have served as educators or administrators at public and private schools. There are also study abroad options, with student teaching experiences in Central America, South America, Africa, and other locations. Individuals looking for scholarship opportunities to help fund their studies may apply for the TEACH Grant, which is for students who would like to work in high-need areas after graduation. There are other endowed scholarships for students based on financial need, academic standing, and cultural backgrounds. To be eligible for transfer from another institution, MVNU requires a minimum grade point average of 2.0 in all previous postsecondary coursework. The University of Toledo's affordable online ECE degree is designed for students who already hold an associate degree in early childhood education. The program combines theory, research, and practical experience and focuses on developing future professionals who will help young people grow, develop, and thrive. Prospective students must hold an associate degree from an accredited postsecondary institution and have a minimum 2.70 GPA throughout their lower-division coursework. The program only accepts students who are currently employed in a preschool, head start, or childcare setting for at least 20 hours per week. UT offers free transfer counseling and an official evaluation that happens immediately after the university receives an applicant's transcripts. There are several scholarship opportunities reserved for transfer and non-traditional students. The Vanguard University BA in early childhood education degree is a flexible way for individuals to prepare themselves for careers that are focused on helping young children grow and develop cognitively, physically, socially, and emotionally. The program requires students to complete at least 124 credits, with 55 of those credits taken within the major. Courses are focused on leadership and advocacy, literacy, curriculum design and development, and teaching mathematics and science to young children. There is also a special education emphasis, which covers the areas of inclusive classrooms, applied behavior analysis, and teaching children with severe disabilities. Vanguard University is located in Costa Mesa, California, and currently serves more than 2,000 undergraduate and graduate students. The school's affordable online ECE degree program meets all requirements of both Title 22 and Title V in California. Chaminade University's BS in early childhood education is designed for individuals looking to enter or expand on careers working with children between two and a half and six years old. A montessori credential is also available for students interested in working in a more specialized educational environment. To earn the online early childhood education degree, students must complete 120 credits. Thirteen of the credits must come from pre-major requirements, which include topics like child development, music and art, and health and family issues. Students take 40 credits within the ECE major. A seminar with a fieldwork experience caps off the program, which typically takes about two years to complete. CU's affordable online early childhood education degree is part of the professional and continuing education undergraduate program, which focuses on helping adults and working professionals obtain their degrees as efficiently as possible. Saint Mary-of-the-Woods College, located in Terre Haute, Indiana, delivers an online early childhood education degree that's designed for individuals who wish to inspire a sense of curiosity in young children. The program is flexible and offers an exceptional level of support to distance learners, including academic assistance and comprehensive career services. Students enrolled in the college's ECE degree online program may choose from concentrations in mathematics, reading, social and behavioral sciences, and social studies. The program can be completed entirely online through Woods Online, which features flexible transfer policies and various financial aid and scholarship opportunities. SMWC is a Catholic and liberal arts institution that currently serves about 1,700 students. The early education program is accredited through the National Council for Accreditation of Teacher Education. National University's BA in early childhood education is based on research, theory, and modern practices in education. The program provides students with the knowledge, skills, and real-world experiences they need to become effective professionals in the field. The program focuses on the design of sound learning environments, curriculum development, and best practices in instructional strategies. There are concentrations available in early childhood administration, infant and toddler education, and teacher education. The early childhood education degree online requires students to earn at least 180 quarter units, with 45 or more of those credits completed in residence at the university. Learners must also complete 76.5 quarter units in upper-division courses. Students take part in an academic seminar and field experience, which is a way for them to apply the knowledge they have gained throughout their coursework. The University of Cincinnati offers a BS in early childhood education degree that can be completed online. The program, which is accredited by the Accreditation of Educator Preparation, prepares graduates to become successful teachers in the state of Ohio and gives them a cohesive understanding of early childhood theory as it relates to young people from birth to age five. Students must maintain a 2.8 GPA and remain in good academic standing. Successful graduates are prepared for a variety of career options, which include serving as a head start instructor, preschool teacher, infant and toddler specialist, and program administrator. Students may begin the university’s ECE degree online program in the fall, spring, or summer semesters. The program takes about four years to complete, including general education requirements. It takes about two years for students to complete upper-division coursework. Lewis-Clark State College, located in Lewiston, Idaho, offers a bachelor's degree in early childhood development that prepares students to design curricula, plan classrooms, and deliver learning opportunities to young children from birth to age five. The program focuses on establishing safe and healthy learning environments, supporting child development, and creating strong and positive relationships with parents and guardians. Students must earn at least 120 credits to be eligible for graduation from this affordable online ECE degree. At least 33 of these credits are within the major, and classes cover the areas of diversity, behavioral ways of knowing, scientific ways of knowing, humanities, and oral and written communication. Students also engage in an internship opportunity. LCSC is a public postsecondary institution that was founded in 1893. It currently serves more than 4,300 undergraduate and graduate students.